your whole family will love! Being a mom to two active, growing teenage boys, I'm always trying to incorporate more fresh fruits and veggies into their diets. Sometimes I have to be sneaky, but most of the time I don't. I'm lucky that they aren't too picky, and love a wide variety of foods. My oldest especially, will eat just about everything I serve him. From spinach to arugula to asparagus, there isn't much he doesn't like. When I was recently asked to help promote the 13th Annual Produce for Kids campaign, I was thrilled! This healthy eating-focused campaign with Meijer launched May 31st and will raise funds to bring the nutrition education program, Jump with Jill, to local schools in the Meijer area. The Produce for Kids campaign offers Meijer shoppers in-store and online meal solutions, recipes, and tips to families looking to embrace healthier eating habits. 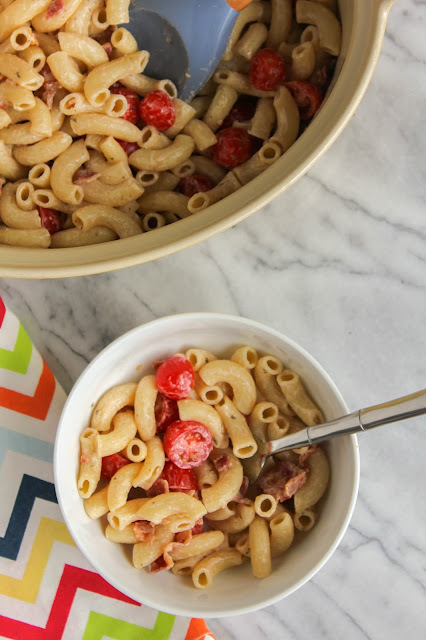 I came up with a super simple, four ingredient pasta salad recipe that both kids and adults will love. 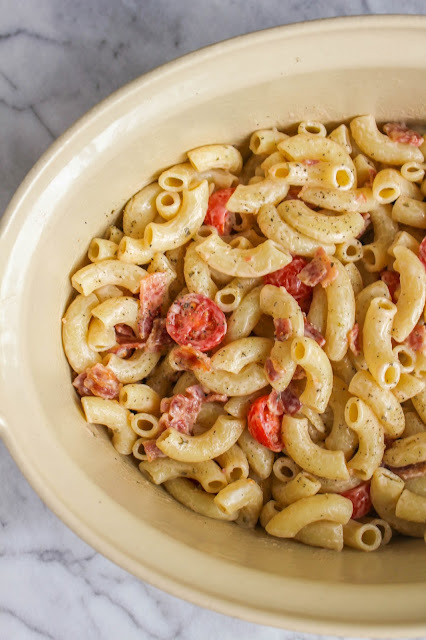 Fast and easy to make, perfect for potlucks, parties, or just for the family, and full of juicy and delicious NatureSweet Tomatoes, this dish didn't last very long in my house. And seriously, it's just four ingredients! FOUR! 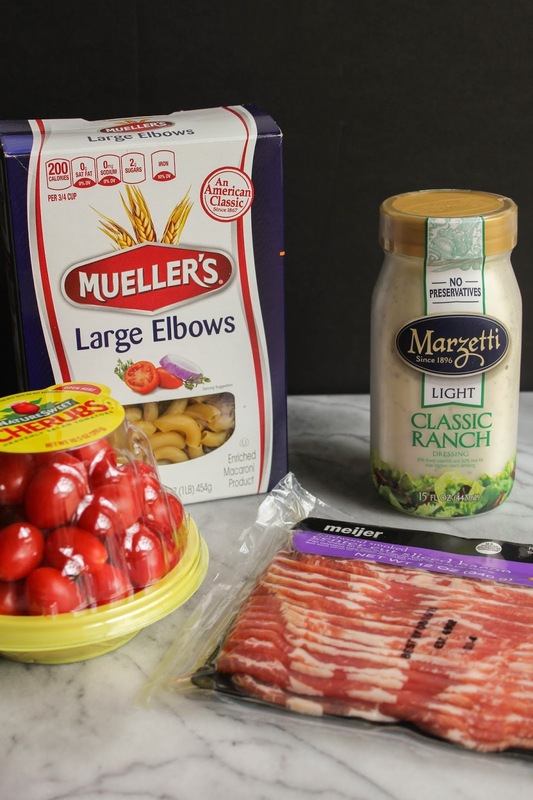 The bacon pieces are salty and crispy, the tomatoes are juicy and fresh, and the Marzetti Light Classic Ranch dressing is tangy. It's a perfect combination of great flavors. And what kid doesn't love bacon? Excuse me, what adult doesn't love bacon too?! 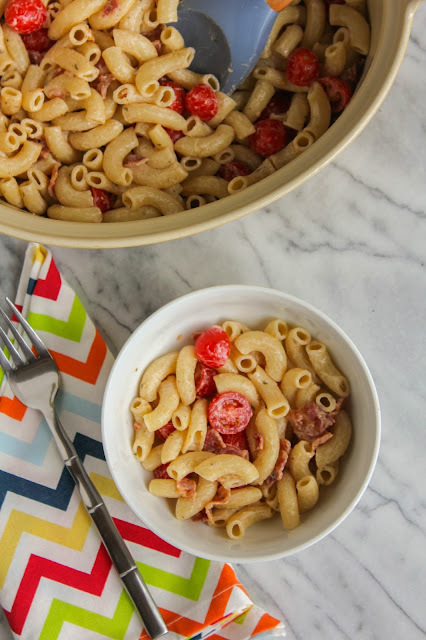 As I already mentioned, this is also perfect for potlucks, so feel free to double the recipe! You will definitely love some leftovers, trust me. Cook the macaroni according to package directions. Drain and rinse under cold water. Drain again, then place in a large serving bowl. Add in the bacon pieces and tomatoes and toss to combine. Pour the dressing over the top and carefully mix it all together. Sprinkle with salt and pepper to taste. Add more dressing if needed. Refrigerate until ready to serve, and refrigerate any leftovers. 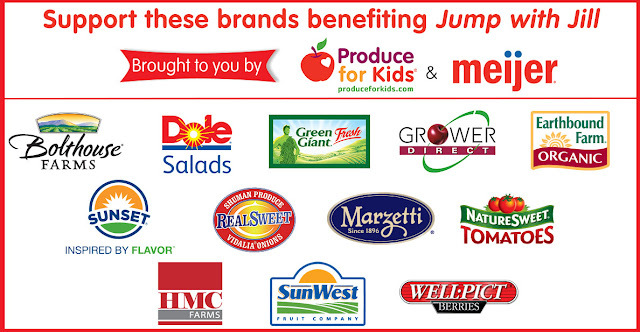 The Meijer and Produce for Kids campaign will run through June 27th and is supported by 11 participating fresh fruit and vegetable companies, which are listed in the graphic below. Meijer grocery shoppers are encouraged to support these brands by eating more nutritious fruits and vegetables, and they can also sample simple, healthy Produce for Kids recipes at select stores on June 13. To learn more about Produce for Kids and their Jump with Jill campaign, visit their website or find them on Facebook, Twitter, Instagram and Pinterest. You can also find some amazing recipes in the Recipe Index of the Produce for Kids website!